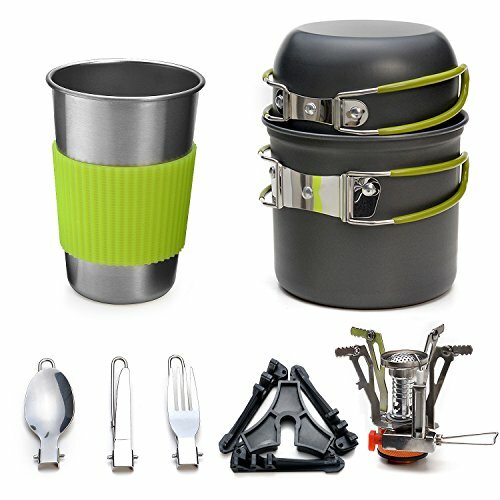 Odoland 9 piece Camping Cookware Kit is for anyone loves outdoor activities. Each cookware kit includes 1 mini stove, 2 pots, 1 spoon, 1 fork, 1 water bottle with anti-heat protector, 1 knife and 2 carry bags. The stove and pot handles can be folded to safe space. The anti-slip pot handles and the silicone cup protector are all anti-heat and can effectively protect your hands from injury. One Kit meets all your needs! It will be your great outdoor companion, no matter you go camping, hiking, climbing, hunting or just go for a picnic! Anti-slip & anti-heat handles: The anti-slip pot handles and the silicone cup protector are all anti-heat and can effectively protect your hands from injury. One Kit meets all your needs! You will definitely be amazed by this professional outdoor camping cookware kit! Enjoy Cooking Anywhere You Go: This awesome cookware kit is designed for anyone loves outdoor camping with families and friends! It is super-portable, making it much more convenient for camping, hiking, backpacking, picnic and other outdoor activities!